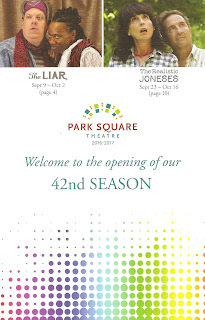 Playwright David Ives' adaptation of the 17th Century French farce The Liar, now playing at Park Square Theater, is a like a Shakespearean mistaken identity comedy (two women are mistaken for each other, and there are twins) mixed with a bit of Jane Austen (it's all about who marries whom and what they can offer), told with a sort of Spamalot wackiness, but instead of music there is rhyme. Sure the plot is sort of sexist (a man woos a woman he barely knows, then quickly switches to another woman he barely knows, and the women only care about getting married), but that blow is somewhat softened by the casting of a woman in as the most offending man, the titular liar. And the silly plot is just a frame upon which to hang the clever and beautiful pentameters and the hilarious performances by this fantastic eight-person cast. The very loose premise of the plot is that a man named Dorante (played as a lovable mischievous rascal by a woman, Shá Cage) comes to town (Paris, of course) and tells nothing but lies. He soon partners with Cliton (a hilarious Zach Curtis, who also functions as sort of a narrator), who cannot tell a lie, until his boss teaches him how. They spot two woman (India Gurley and Sara Richardson) and a servant (Shanan Custer, garnering the biggest laughs with the fewest lines), and naturally Dorante falls immediately "in love" with one of the woman, speaks a few words to her, and is determined to marry her. Problem is he doesn't know her name. Cliton asks the servant (who, surprise, is a twin!) and gets a vague answer, from whence comes the confusion and the entire set-up of the plot. Adding a few more complications are one of the women's long-standing beau (played by JuCoby Johnson, breaking out of type and playing a not-so-sweet boyfriend), his friend (Michael Ooms) who loves one of the servant twins, and Dorante's father (Rex Isom Jr.) who wants grandchildren. After much delightful chaos and confusion, in the end eight characters are coupled off in marriage (because marriage = happy ending, right?). Directed by Doug Scholz-Carlson, the cast is incredibly playful, while still delivering the iambic pentameter in a clear and understandable way. 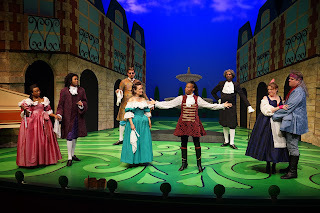 Because Eli Schlatter's two-dimensional, bright, cartoonish set has a severe decrease in height for perspective of distance, all of the cast drops to their knees as they retreat to the back of the stage, which is endlessly entertaining. They also play up the awkwardness of sitting on two-dimensional furniture. Rebecca Bernstein's costumes are also playful and colorful extremes of the period (except Cliton, who's inexplicably dressed as an '80s rocker). 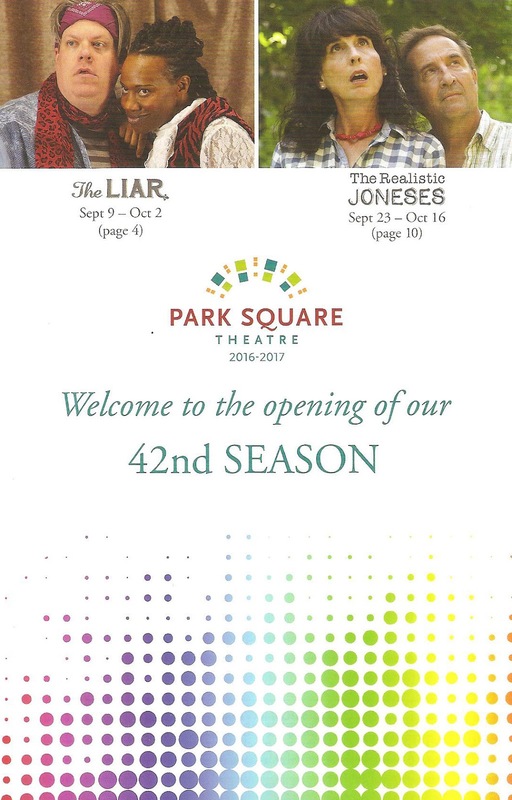 The Liar continues through this weekend only (closing October 2). Highly recommended for fun, light-hearted, escapist entertainment.